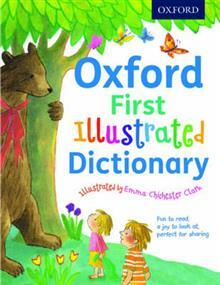 A beautifully illustrated, alphabetical first dictionary to engage children and encourage first literacy skills. Jokes, riddles, anagrams, and rhyming words create a fun introduction to words and language. Share in the delight of discovering the magic of the words and all the lan... read full description below. The Oxford First Illustrated Dictionary, beautifully illustrated by well-known picture book artist Emma Chichester Clark, is the perfect first building block for 5-7 year-olds to engage with words and language. Over 2000 entries give clear meanings and definitions, parts of speech, word forms, word families, synonyms and opposites to build vocabulary and first literacy skills. Not just a dictionary, this unique book brings to life the world of fairy tales, nursery rhymes, and picture books that children love. Winnie the Pooh and Georgie Porgie appear alongside Aladdin and Cinderella in the innovative example sentences. Rhyming words, little words hiding in big words, and riddles provide plenty of opportunities for fun word play, along with amusing word jokes and child-friendly word origins. The entry for 'crocodile' tells the child that the word comes from a Greek word meaning 'lizard' and ends with the joke: 'What's a crocodile's favourite Game? Snap.' This wealth of information and fun with words is presented in a contemporary, easy-to-use, engaging layout, creating the most accessible and affordable dictionary and gift-book combination, the perfect buy for Christmas and holidays as well as for everyday use.